Technology is expensive and can be a real drain on us when we buy our first computer, smartphone, or other device. But the expense balloons when it comes time to upgrade, and computers are notorious for piling up huge costs as part of our pursuit of the fastest and biggest equipment. To make matters worse, most of us are advised about upgrading by people who are trying to sell us the upgrade. Of course they think we need a new computer; they want to sell it to us! But a careful examination of our situation can create a more objective view of whether we should upgrade or not. 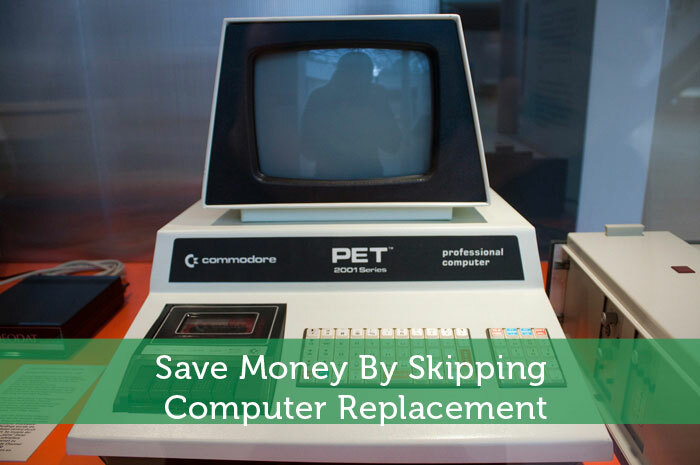 Many times, the result is to keep the old computer, and here are some of the key reasons for that conclusion. The high speed at which new computers hit the market means there is also a rapid movement of old machines into the waste bin. When we replace a single unit, we may not think that much about the impact, but taken in the context of thousands of other simultaneous replacements, the overwhelming amount of cyberjunk generated in the world can’t be ignored. Bear in mind that the amazing sales numbers we hear about new machines are comparable to the numbers of deactivated old ones. These numbers also make very fine inspiration for upgrading the intangible and keeping the tangible. For as long as your computer can manage it, you can install software upgrades and add memory without contributing to the growing piles of busted equipment that are accumulating in waste facilities. At most, you’ll have a few recyclable cardboard packages, compared to several pounds of metal and plastic with no real use. For those of us who like environmental green in addition to financial green, this is an important motivator. No matter how smooth the transfer, let’s face it. You always worry that not everything will make that quantum leap from the old machine to the new one. And even if all your files do arrive safely, you can encounter weird location changes, folder name quirks, and other disruptions to their use. It used to be easier. Most people had a big cache of word processing files and that was about it. Much of that stockpile was out of date, too, so a good file cleansing often preceded the transfer. Now there is far more content on your computer that is sentimental or expensive. We have hundreds of pictures and all kinds of purchased downloads of movies and music. Sure, there is Cloud storage to circumvent this problem, but for financial software and other sensitive items, we want to stay local. For that reason, it helps to avoid a complete replacement. New equipment comes out constantly. It might not be as fast as during the crazy processor upgrades of the 1990’s, but there is always that pursuit of the next new thing. In the meantime, every program and app you can imagine is also constantly updating and upgrading. The expense and inconvenience of constantly bringing everything into the newest day can be maddening, especially for those of us who simply must have the latest versions. The side-by-side pursuit of new computers and new software is too much. If you’re the type who is running this race, let the hardware go. Perform upgrades, buy new versions, and keep your functionality current. You will gain far more benefit from installing an upgraded antivirus software for Mac. Also, bear in mind that most new gear carries excess capacity that is far beyond what you need for even the very most current applications, so a new machine can be a bit like using a school bus to drive two friends around. Sticking with your familiar, functional old vehicle and concentrate on what’s inside it. I have my 4 year old HP laptop, I am already planning to buy a new one because it always hangs and I noticed that sometimes it always overheat. But, I still prefer to keep it instead of buying a new one because of my important files. You can reinstall the operating system (with minimal file loss or none, depending on how organized you are). Would probably solve at least one of the problems (the slowness). I have used my first laptop for 6 years, the second one broke down after 2 (aaarrgghhh) and this one has been with ‘us’ since 2013, hope to get at least 3 more years on it. I am really bad with this for I never try to fix my electronics, but will not hesitate to use my plastic and buy a replacement. I realize I need an intervention, but that’s why I take really great care of these high price items. I’ve had my laptop for just over four years. The only reason I would want a new one is that it’s so heavy to carry around. Other than that, I am quite happy with it. My fiance who’s into building and fixing computers, pimped up my computer and now it runs super fast. I work tech in Silicon Valley and my laptop is always old. Even when I buy a new system, it’s never the latest and greatest tech. It gets obsolete and depreciates so quickly, it’s best to get something mid-range as long as it meets your needs. As long as you’re not gaming or mining bitcoin, any cheap laptop is fine for web, email, video/photo, office. @Clarisse – take your computer to geek squad and have them clean out the inside – the cooling fan is probably stuffed with hair and dust bunnies and not getting enough air flow. While they’re in there have them replace the thermal grease between the CPU and the heat sink. Those are the 2 most common causes of overheating. We have two main computers that we use. My desktop is probably 10 years old. I maximized all the RAM and HDD years ago, and it is definitely starting to get a little long in the tooth. My wife uses a laptop that’s probably about 7-8 years old, but we just purchased a replacement computer. The machine is very slow, is overheating and starting to fail, and my wife runs her side business from that, so the investment is worth it given the use we have gotten out of it. When I go to LA, I would surely enjoy every free stuff I can get, one which is the Hollywood Walk of Fame. And, I would just rather walk so that I can get a lot of its culture and experience it more compared with taking a ride.